Hello, today let’s talk about Garage Kits, GK in short. I was always fascinated by GK’s in general they look more creative and elaborate than PVC figures , when done by professionals. 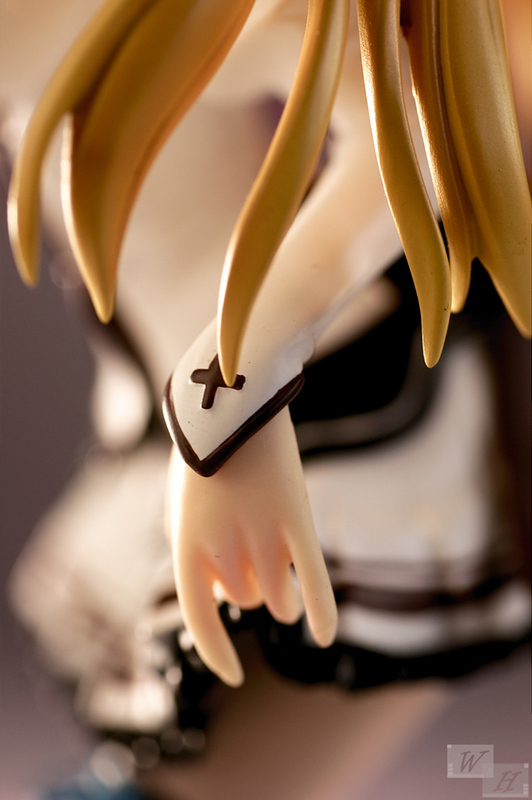 The regular PVC figure buyer won’t be able to create the best results, speaking for myself. I built tanks, helicopters and mechs in the past, but thats a lot different from assembling and painting bishoujo characters, I actually made a little chibi GK of Dead Master last year on my own and it was a pain and the result was so so. 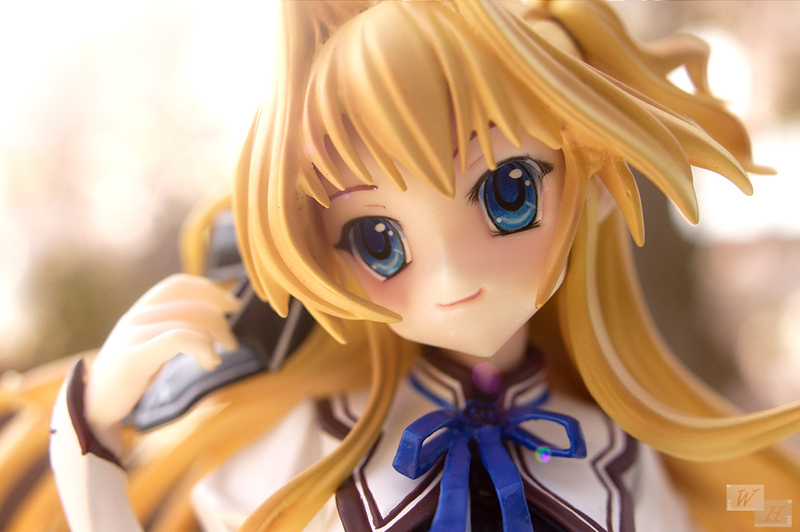 I still have Kannagi’s heroine Nagi as unfinished GK at home. Now I know for sure that I can’t build her, I already contacted an professional GK service, but what prevented me from sending Nagi in, was 1st the high price and 2nd the fear of being not satisfied with the final figure. I should really think about it again, since it’s a really beautiful GK. Here the little Anime special with Airi, she’s a little tsundere, who wants a hug. Anyway this post is about Sena Airi from the VN and anime Mashiro iro Symphony. I always wanted the GK of her, the first time I noticed this certain figure was at a Wonderfestival of 2010 and the wanted GK was sold as Exclusive GK on Volks online shop on the 27 April 2010. I used the help of a proxy service, but in the end I wasn’t able to make my order since it was sold out within a few minutes, what a straight defeat. This always bothered me, but a few years later I should get my chance. In the middle of December 2012 I secured my preorder at E2046 as their partner Company, Gathering offered the pre painted and assembled GK for a fair price. There is always the term bootleg in combination with GK figures from E2046, they are recasting GK kits from artists and sell them through their shop. It’s a n exhausting discussion if it’s legal or not, but so far no one seemed to sue them so why should I care. E2046 offers are an easy way to get your desired Kits, way easier than searching, contacting the artist and aquirering the original GK . So I say: if you don’t make it accesible for me I’ll get it somewhere else! This GK is recast from the kit of the artist Milchestrasse which was made in April 2010. 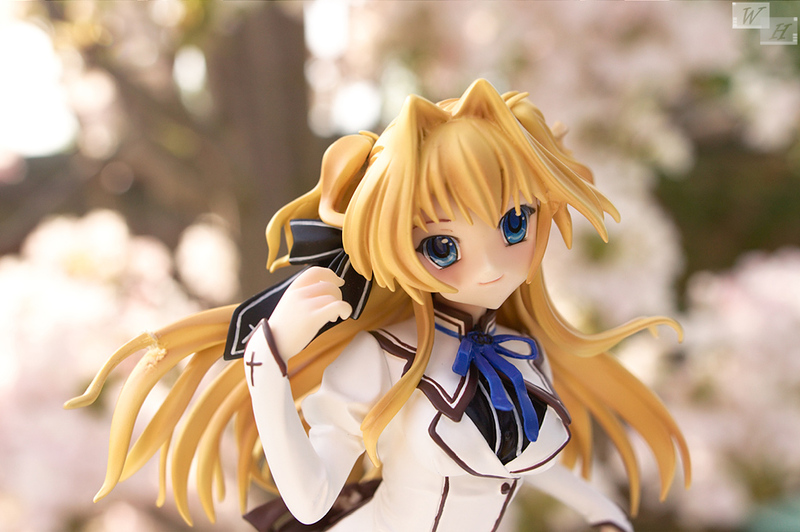 As mass produced small batch series, Gathering offered the Sena Airi GK for around 131$ . 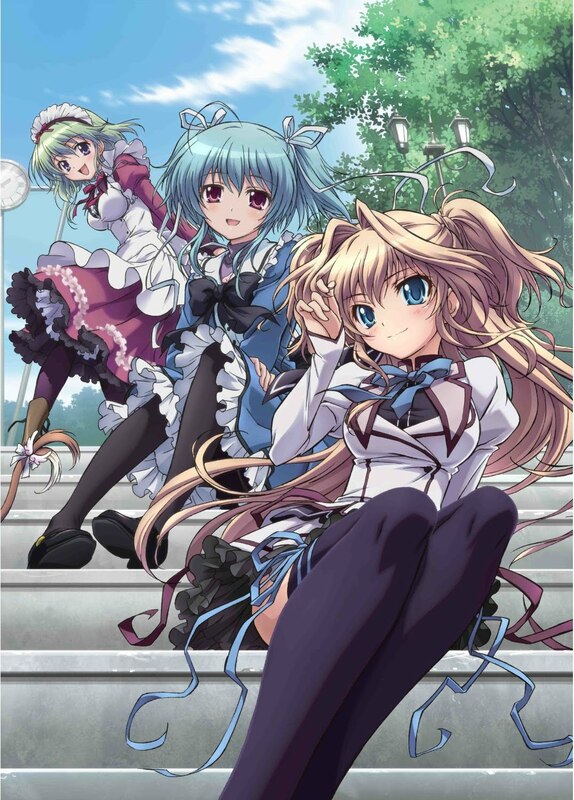 The origin of Sena Airi is the Visual Novel Mashiroiro Symphony: Love is pure white, it had exceptional cute and appealing graphics and a lovely school uniform design. I played a bit of the untranslated game and later the game got an anime adaption. Sena Airi actually was the lead girl in the game, a proud girl from a rich family who pursued the rough way of independence. In the anime they surprisingly choose another girl to win the “love race” for the main character. GK’s are made of resin, which is not as flexible as PVC and so it can happen that they take some damage during the shipment. Sena Airi was packed with care in a especially cut out foam to prevent her from damage, but unfortunately she arrived not completely intact. The big ribbon at her back broke off and one strand of her outer hair snapped. Since the place where the ribbon belongs is hard to reach and the strand broke off in a very noticeable area it was pretty annoying to receive the figure with hard to repair damages. Do you know good resin glue? Furthermore the GK figure requires some minor assembly, the blue ribbon, the right bush of hair have to be put in place and the figure has to be placed on her wooden base, these are just simple thhings to do before the figure is ready to be displayed. 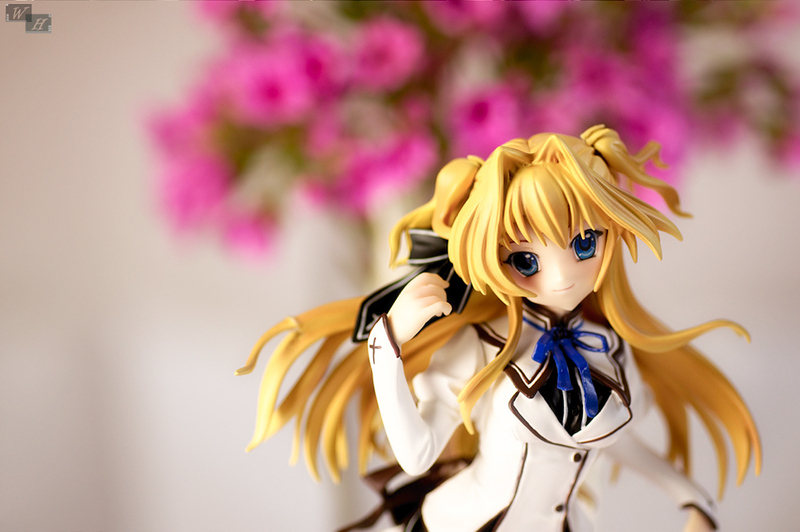 Since Im scared of damaging her during dusting, I rather buy a small glass cabinet soon and make a little Diorama. 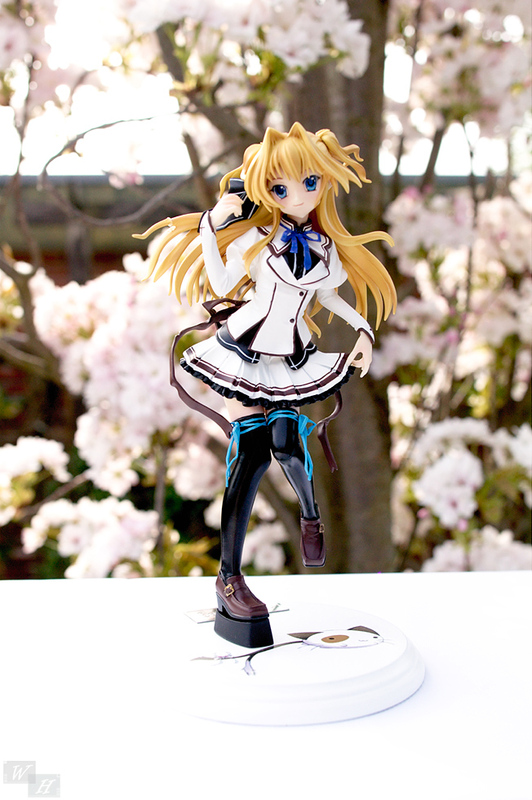 This Sena Airi is a regular sized 1/8 scaled figure with 21 cm of height she fits very well other figures of this scale without odd height differences. On first look Airi has a lovely presence thanks to her bright uniform and flowing long hair, lets find out more in the next paragraphs. 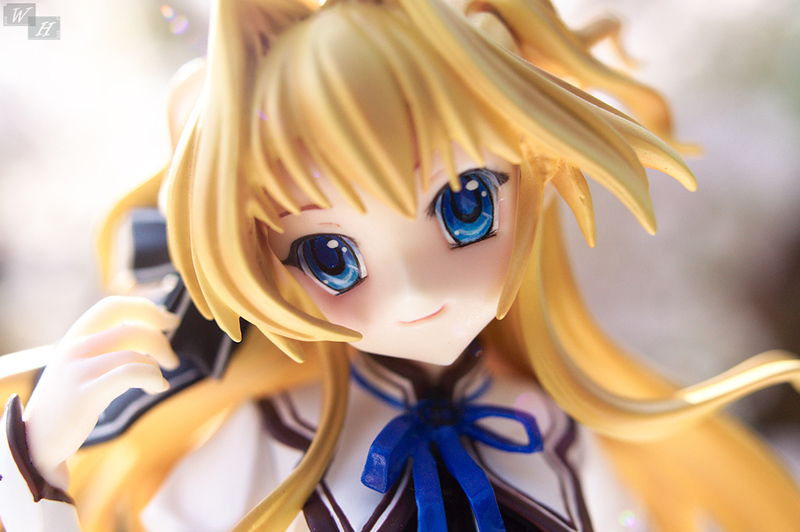 Aside from my ugly provisonal glue mark, the figure has cleanly sculpted hair with a number of single strands. The haircolor turned out a bit more yellow compared to her hair color that she had in the VN, it still looks very nice, the applied brown shading does a good job in that regard. Actually I was super scared that the face turned out bad, since the face is the most important part on a figure for me. I nearly had nightmares shortly before she arrived here. The more surprised was I when I carefully opened the box. She has a beautiful face to be honest with beautiful, detailed eye decals and subtle applied rosy cheeks. Her lined mouth shows a subtle smile that gives her face a kind expression. Even though the material is different Airi’s skintone and texture doesn’t look much different from PVC figures, maybe a little smoother actually. 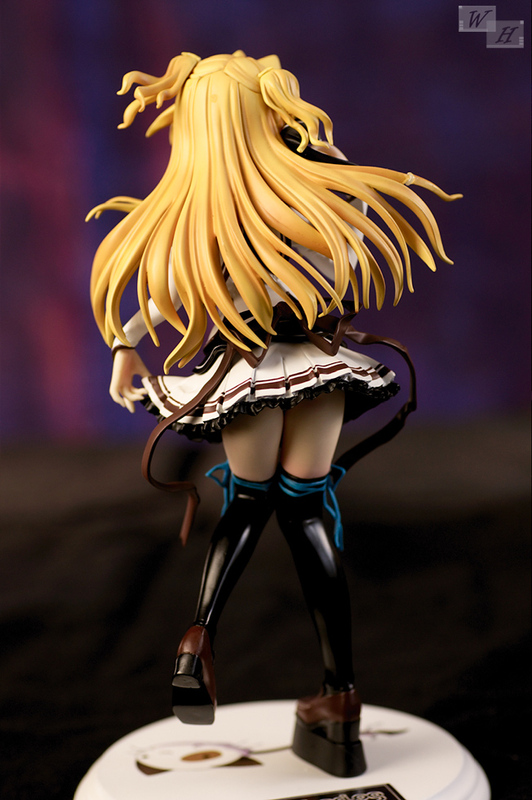 Airi’s pose captures her in a sweet and playful manner with one foot in the air and her flowing hair. With one hand she is playing with her hair while the other one is holding her skirt. Like I already said, the shool uniform has a beautiful design, Airi is wearing a black shirt with a cream white blazer above. Her rather short skirt has nice brown lines and a black outer rim. As demure student she is wearing white pantsu. There are a number of details that make the whole outfit even more appealing, like the huge ribbon at the back or the black one in her hair. 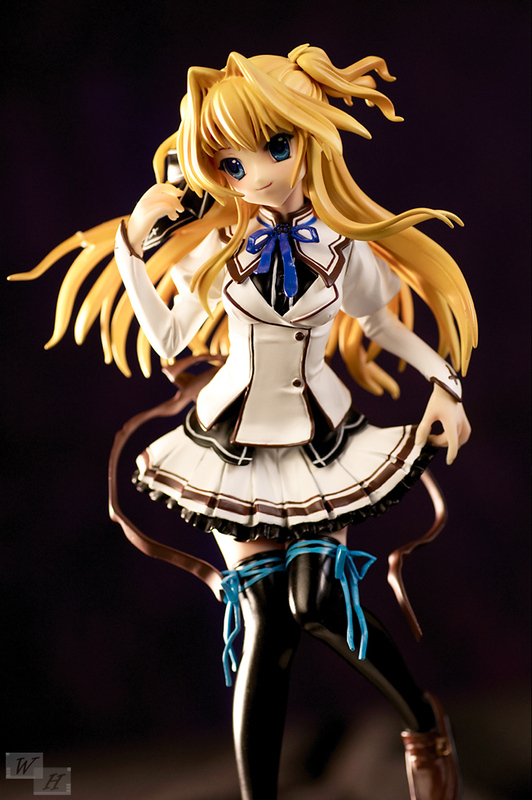 This figure is attractive, since Airi is a pretty girl, but doesn’t have much direct fanservice, except the tightness of her blazer or the short skirt, she mainly has nice and pure bishoujo appeal. 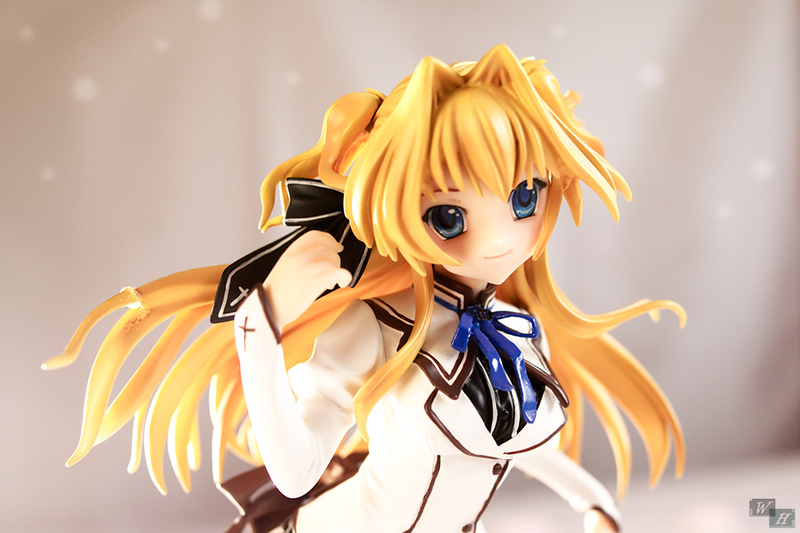 As far as I know Sena Airi is a completely handpainted figure, a very clean painjob on top of that. The design outfit of her relies a lot of fine lines and that makes it even more astonishing, this would easily something to be messed up on a mass produced PVC figure. The lining looks really impressive overall with next to zero overpainting. There is no visible shading on her outfit, the wrinkles and folds don’t necesssarily demand it, since natural light already creates appealing shadows that make the figure look nice and convincing. If there is one thing to criticize, I would say that glossy color of the ribbon around her neck disturbs the overall appearance a bit. So the impression of my very first Garage Kit turned out quite positive, after I was really scared of receiving something I wouldn’t be satisfied with. 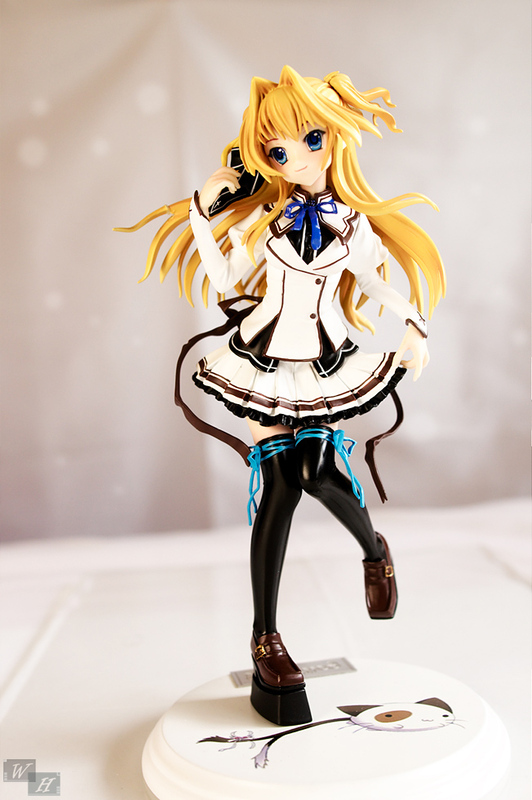 The outfit looks beautiful and the figure has a pretty face. It was very nice that Sena Airi turned out like the promo shots implied, Gathering seems to have a very good quality assurance. The two damages of her, that possibly happened during shipment were a bit dissapointing, but actually the overall impression outweights it by far. Do you have any experience with bishoujo GK’s ? Dude, you didn’t get a garage kit, you got a Gathering version (brand of E2046) of a garage kit. When you say it’s your first GK, it sounded like you finished the kit, yet you didn’t. Please be aware. By the way, Gathering series is supposed to be of higher quality of PVCs, basically for the material as well as the painting procedure applied. 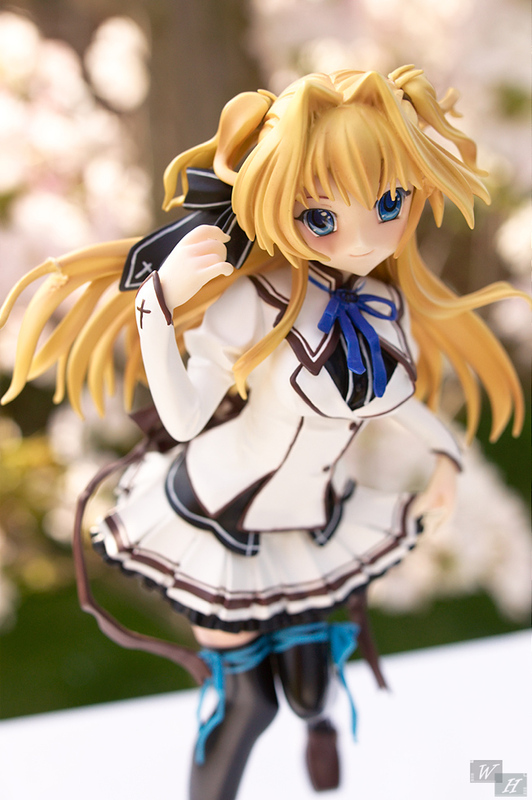 Skin tone shading is very negligible in PVCs yet a big selling point in Gathering. But if you focus on photography, then the shading is less important. I always think GK builders shade because they assume the viewer has no control over lighting. But if you only show pictures, then lighting is under control and shading isn’t as important. If you compare a same model of Gathering and PVC in a rainy day, you should see the difference. 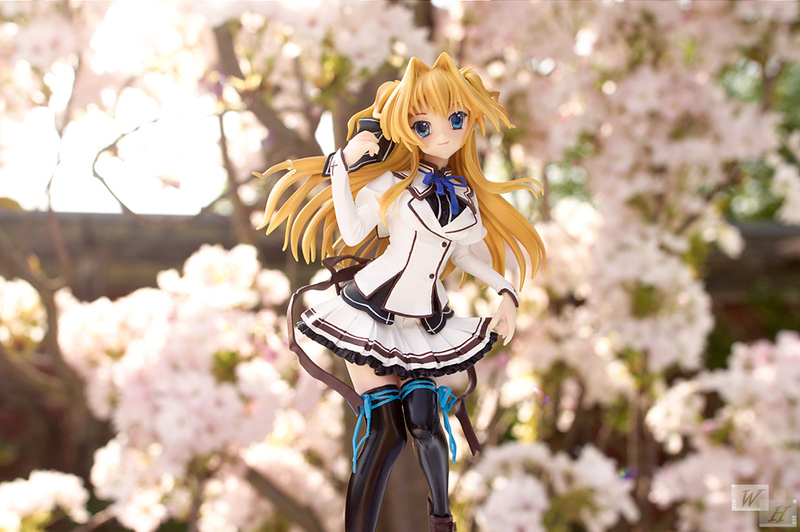 shading isn’t always necessary like this assembled figure shows in a beautiful way. But it can highlight certain details and the viewer likes such things overall. Ok it wcame in assembed, but In the end it is a garage kit,won’t you agree? She is very cute; I remember seeing pictures of her at the various conventions that Volks attended. It is too bad that Volks doesn’t produce PVC or mass-market figures of their resin kits; they have a lot of really nice stuff. Although the schoolgirl thing has been done to death, she still looks very distinctive and elegant. (For some reason I find myself wishing that Aya from se.Kirara had a uniform like that, instead of the less interesting nightgown-looking uniform she wears). I’m not at all familiar with Sena’s source material but I recall seeing her featured a lot, so it’s pretty surprising to hear that she didn’t become the hero’s main squeeze. This reminds me that I should take some pictures of umbrella Saber one of these days. getting your hands on original Volks GK’s is difficult, I don’t mind the exclusive PVC figure, even though I don’t understand the no regular policy. I guess they love themself for being a seller of limited stuff like Dollfies and so on :p I never get enough of sailor seifuku, but yeah the fancier the better. Oh wow, and mean really wow! 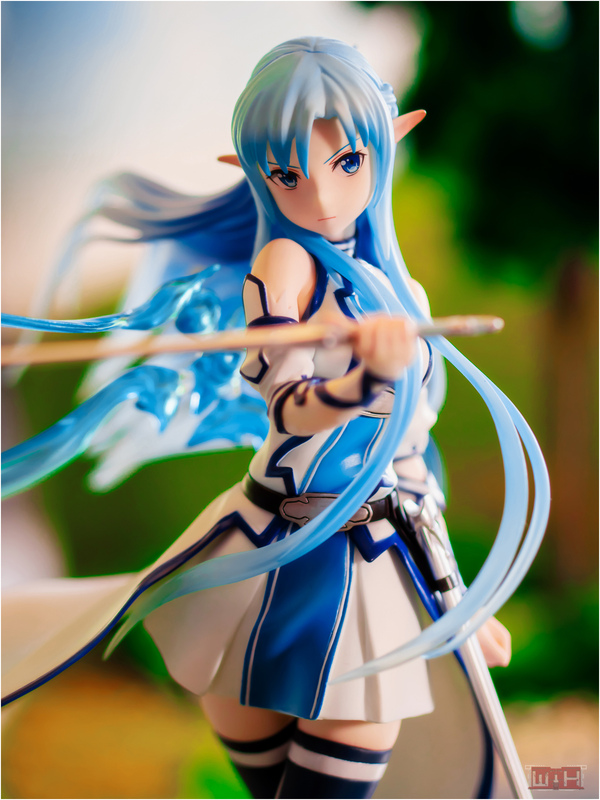 This looks gorgeous, if you didn’t say I would think it was another PVC figure. Shame about the damage, one of the big reasons I stay away from resin. I share your pain with GKs, for a lot of them I just think, oh well and move on. Recently though a couple of GKs I wanted have been turned into PVC releases but this is very rare. I been curious about e2046 but the painted GKs that I want are long sold out or the really expensive ones. 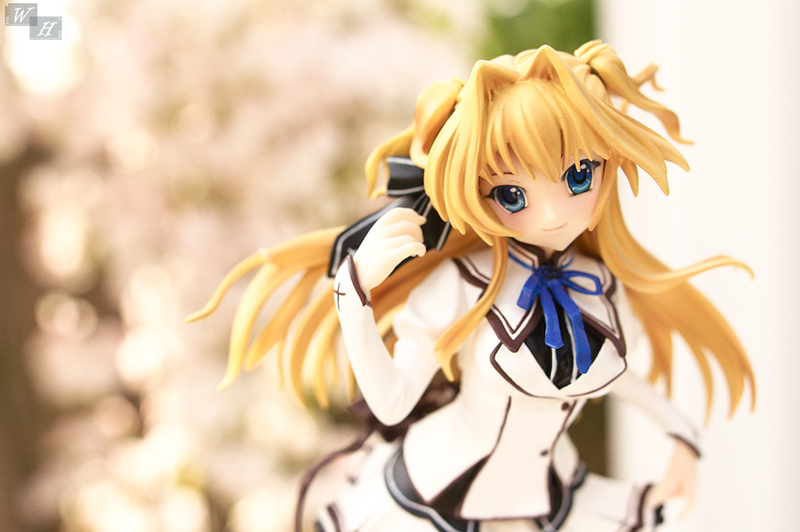 I still think that I failed to show how pretty Airi is, it was “bad” light this day, maybe I’ll do it again. I have to say that this is one stunning figure! 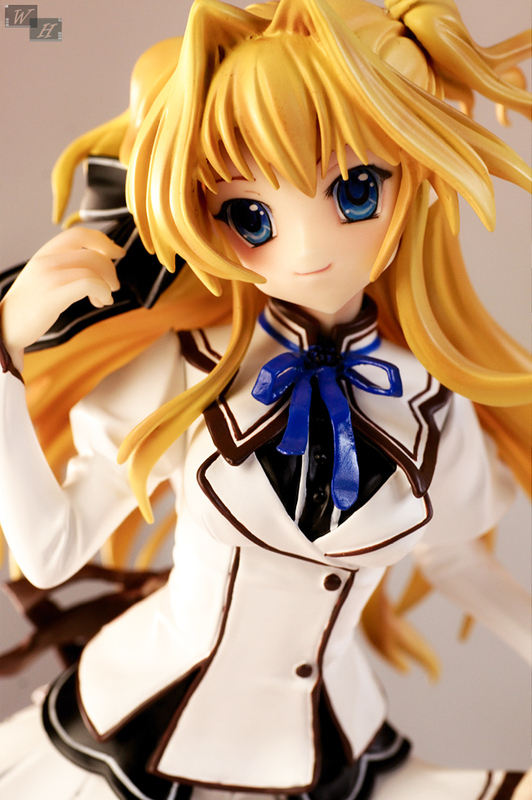 Airi’s character design is already beautiful, and this figure manages to bring out her beauty even more. Garage kits are always nice to look at, but like you, I don’t have the skill to put them together so I just avoid buying them. 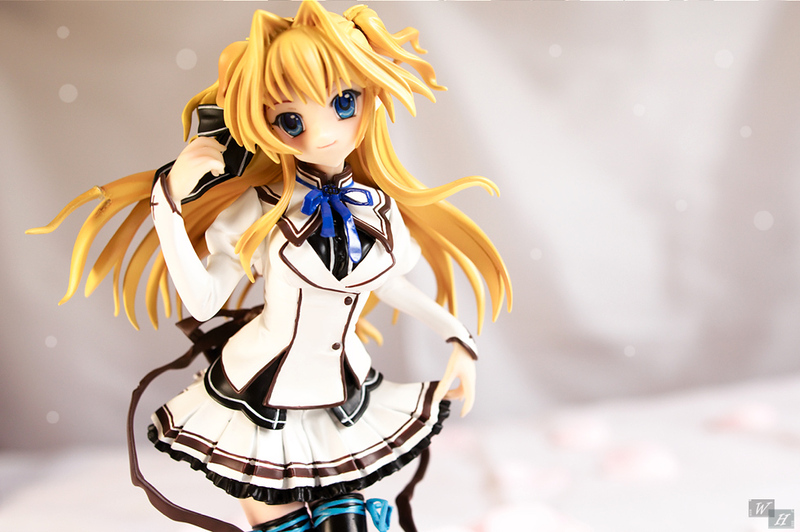 It’s a shame that your figure arrived damaged. The only resin figures I have were also damaged during shipping, but I was able to glue the pieces back with regular white glue. I love her design and the qzuality was far more than I expected. It doesn’t make much sense to buy them i you can’t make the outcome satisfying. 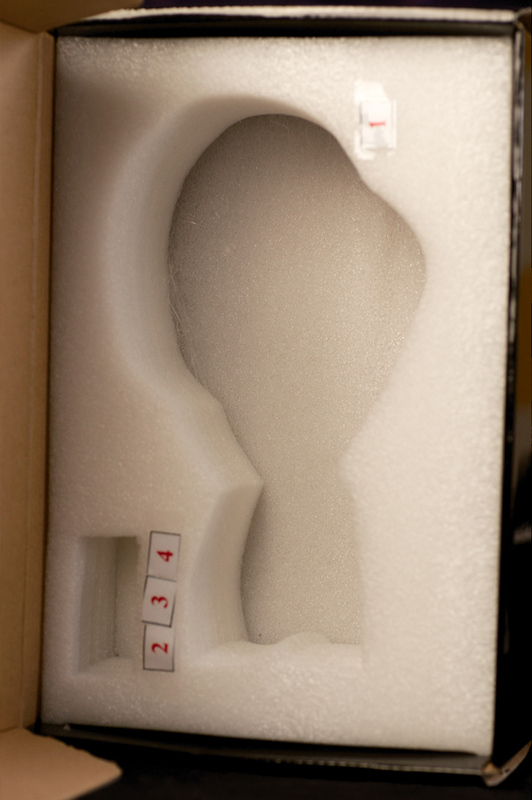 Yes, it was no nice experience, but since it’s very stiff material it is bound to happen when shipped around the globe. The problem is that the places are diffiult to glue, but I’ll try it. Which one do you like, do you have something in particular? Asks WIESELHEAD curiously. Sorry to hear that your Airi arrived damaged. She looks really nice in spite of the glue. I was always rather fond of this kit myself and had hopes of a PVC version one day. I guess seeing her appear on E2046’s Gathering is the next best thing. I don’t personally have any experience with their products, but the handful of other reviews I’ve seen for Gathering pieces have been similarly positive to yours. I don’t have a strong opinion one way or the other on the morality of what they do, but I doubt I’ll ever buy anything from them simply because there’s already enough other stuff out there to keep my wallet occupied without adding Gathering kits to that list. I liked this figure from Volks a lot.I had some doubts regarding this order, but I at least wanted to see a GK fo myself. 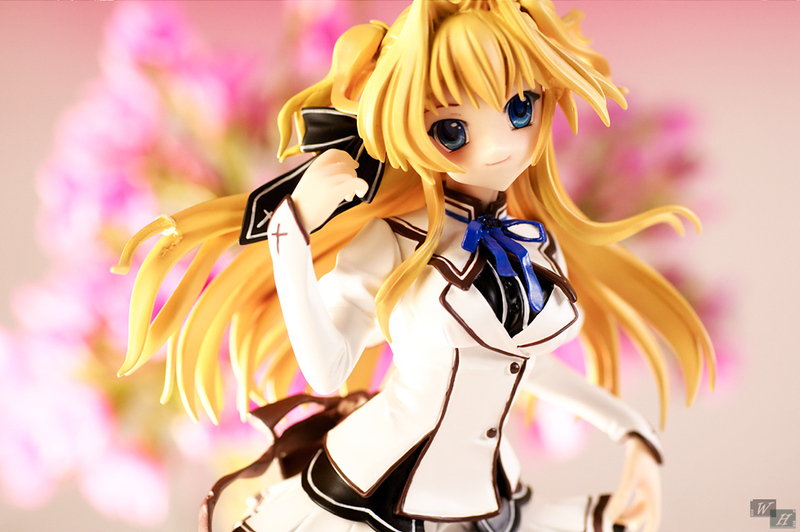 Sena Airi, who I wanted since the first time I’ve seen her, was a pretty test of a painted and assembled GK figures. Ah I see that is a smart decision, the fact that Gathering doesn’t pick many GK’s of my interest ( there are a lot Im interested in), prevents me from getting more. 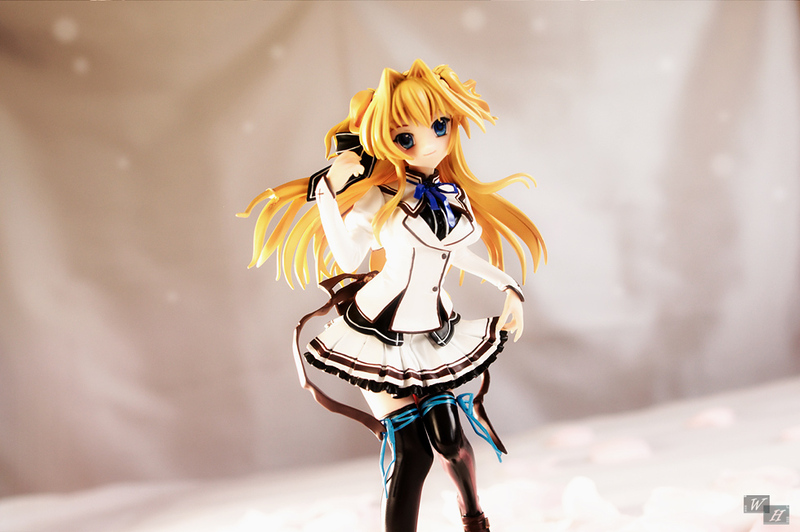 In the end I prefer PVC figures, since they are easier to handle. I don’t really care if they’re bootleg or not as long as they come out nice, and this one came out really nice. There’s been lots of times where I wanted a figure only to find out it was a garage kit and my hopes were crushed. Seems that E2046 is the only place to go for garage kits for anyone not an expert in painting and shading figures, which is almost everyone lol. Yes, it should be not our problem, I don’t like cheap copys of figures, but what Gathering delivers is not really something that should be called bootleg. This GK has a great quality and is very pretty. Since I never had the chance to get her somewhere else, it was a nice coincidence to see her at E2046. It’s always sad to get your figure hopes crushed, these GKs look always so nice. It is quite challenging I assume. 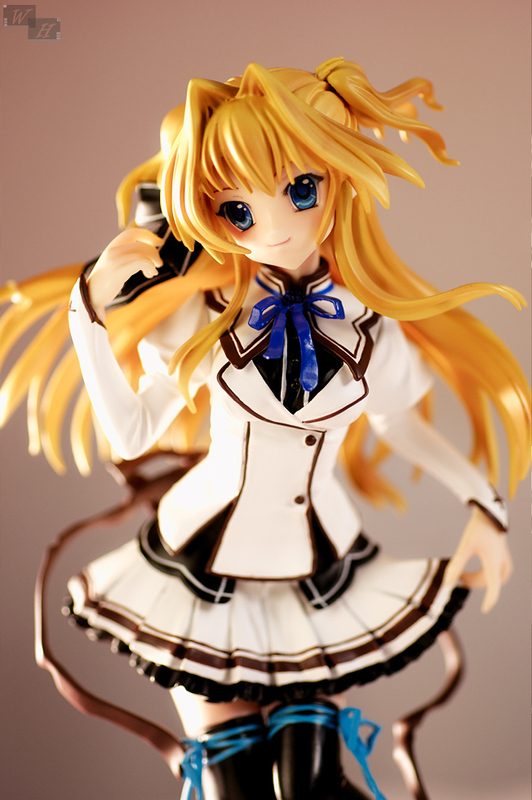 I remember those Mashiro Symphony figures – I was hoping they’d get the PVC treatment, or at least a few of them. Shukufuku no Campanella is a similar series I liked where Volks released a bunch of GK figures that never got a PVC version. I’m glad to hear she turned out to your liking. It’s unfortunate she sustained damage during transit – hopefully you can get her all fixed up. I’ve come close to ordering a pre-made kit from E2046 a few times now, but after taking a few weeks to think it over I end up changing my mind. Maybe one day they’ll have something available I just can’t refuse. Airi looks really nice. 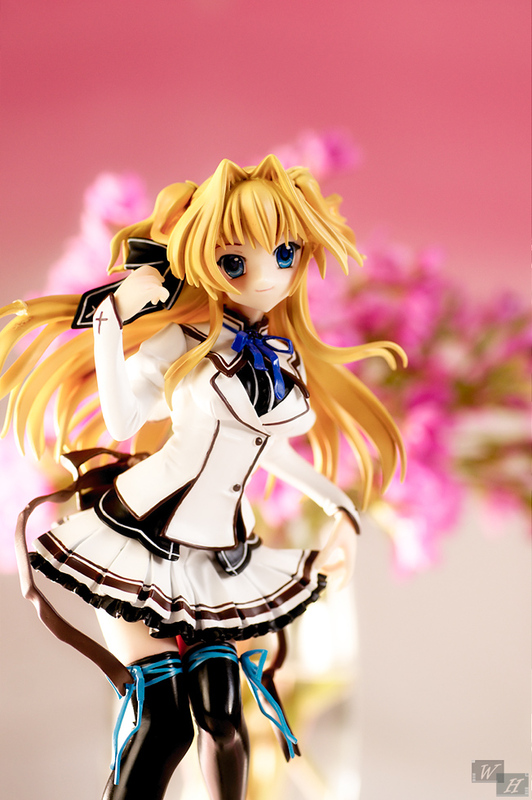 I love the detail of her outfit, so many ribbons and ruffles in her skirt. Her pose is cute, as is her facial sculpt. She looks quite similar to her VN counterpart. Only real noticeable difference as you pointed out is the shade of her hair. At least it makes her stand out more with a brighter hair colour. Yes, I hoped for the same, but it should never happen. I also remember these figures, it’s mean from VVolks to make them nearly impossible to get. It’s nice to see that companies like Phat Company adapt a few nice GK figures to PVC, like Katsuragi or Jack the Ripper. I would wish for more such figure adaptions. Ahaha yeah if more of my desired GK’s were already prepainted, it would be hard to resist. 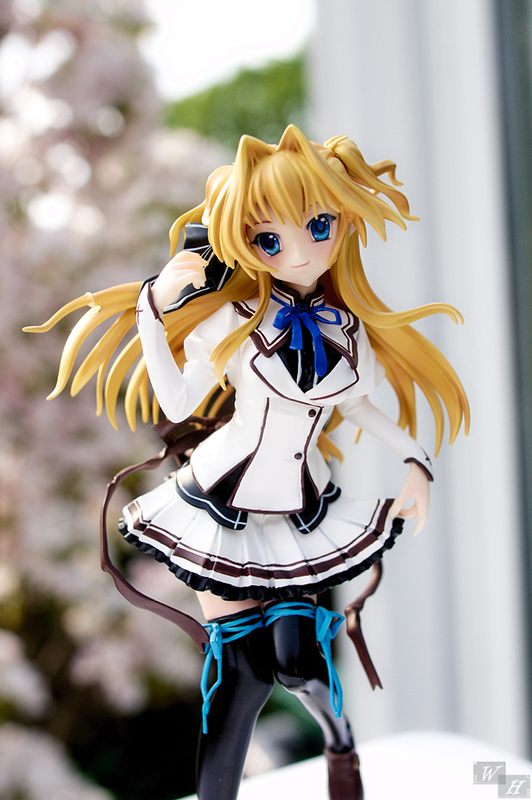 It’s a good looking figure for sure, the school uniform really is something. The haircolor turned out to be a little difficult in postprocessing the pictures, though. I personally don’t think I have any artistic talent, or do I have any patience to assemble anything. I always admire people who took their time to build things, be it dolls, GK, the gundam stuff, etc. What’s even more admiring about them is that they paint them as well. With their own hands! So amazing!! Since we’re on this subject, would you try making one again? No, unfortunately not, I would love to, actually. Ah I see, well the gundam stuff is the easiest one, since Bandai make the things very user friendly. Painting might appear hard, but it’s relatively easy with mechs, since they can look a little rough. When making pretty girl figures you can’t be that forgiving with the paint.